Fayette and Kanawha counties are the place in West Virginia for big bucks if you are up to the hike it takes to find them. Before we go any farther you should know this discussion of hunting bucks in these two counties may not involve a lot about tree stands, shooting houses or food plots. Hunting Fayette and Kanawha counties for gnarly old bucks may be more about finding a narrow bench on the mountainside to watch or an ancient logging road to still hunt. Like gold, big bucks in rough country are where you find them. “Fayette County consists of 629 square miles of deer habitat and in 2017 a total of 2,102 deer were harvested, 927 of which were bucks,” said Todd Dowdy, District Four Wildlife Biologist for West Virginia Division of Natural Resources (WVDNR). “This breaks down to a buck harvest rate of 1.47 bucks per square mile of deer habitat, which comes in slightly below the state-wide average of 2.09 bucks killed per square mile of habitat. Fayette County’s buck harvest has remained stable over the past 5 years, with the exception of a drop in 2014 (725 bucks) followed by moderate bump in 2015 (1,214 bucks),” Dowdy said. The District Four biologist went on to explain that Fayette County’s deer habitat varies greatly from the eastern side of the county to the western side. The eastern side of the county continues to have the highest deer densities, which are due to improved habitat conditions. This portion of the county has a greater percentage of open land versus forestland habitat as compared to the western side (which is primarily forested). The western side also contains more steep and rugged topography compared to the eastern side. Despite lower deer densities and rugged terrain there is a positive aspect to this type of deer country: It produces big bucks. As the record books show, Fayette County has produced some of the state’s biggest bucks. The extreme terrain, rugged mountains, and remote areas allow deer in this county to reach older age classes and that in turn results in increased antler development. The negative aspect to this situation is that the hunting is significantly more difficult. Public hunting opportunities are available at two state-owned Wildlife Management Areas (WMAs), Beury Mountain (9,324 acres) and Plum Orchard Lake (3,201 acres). Beury Mountain WMA is a little different from most public hunting areas in West Virginia. Hunters will actually find some gentle terrain as much of this area lies near the top of Beury Mountain. Broad plateaus will offer some of the best walking in the county, but if you like steep ground, don’t worry; plenty of steep, rough terrain is available in the Ephraim’s Creek and Buffalo Creek drainages. Nearby Babcock State Park (304-438-3004) offers lodging with cabins or in the campground. Access to the area is provided by State Route 41 to County Road 19/31 at Landisburg and County Road 41/12 to County Road 25/2 from Layland, WV. Access is also provided by County Road 25/2 from Thurmond on the New River, although this road is rough and steep and not recommended for two-wheel drive vehicles. Maps of these areas can be found on WVDNR web site at wvdnr.gov. Without a doubt the most overlooked public land in Fayette County is the New River Gorge area, part of the New River Gorge National River. Although administered by the National Park Service, thousands of acres are open to hunting. Since most of this area faces the New River, the terrain is as rough and steep as you might imagine, but again this may be where you find a big buck. Numerous trails offer access into the New River Gorge. The Kaymoor Trail and the Red Ash Trail via the Southside Trail are only two of the dozens of trails available in the New River Gorge for hunting access. The National Park Service office in Glen Jean, West Virginia (304-465-0508, www.nps.gov) is a good place to start for information on the Gorge. Fayetteville, West Virginia is a great town to base your operations out of for this hunt as the town has many restaurant and lodging options. Check out Adventures on the Gorge outfitters (855-379-8738www.adventuresonthegorge.com), which offer several cabins which sit directly on the New River Gorge. “I have tried hunting from tree stands, ground blinds; sat against trees, rocks, stumps and anything I can find to break my silhouette,” said Tim Nibert from Oak Hill, West Virginia. “But I have learned that without a doubt, still hunting is the best way to hunt the rough terrain of Fayette County.”Nibert was born and raised in these mountains and hunts the rough areas exclusively for big bucks. A few years ago, during the first week of the firearms buck season Nibert was returning to the woods after getting soaked in a morning rain shower. “I wasted no time getting back out into the woods because I had seen good movement and the conditions were just right for deer hunting,” he said. “All that morning, I had wondered about deer movement at a small steep hollow that I had scouted and found some fairly impressive buck sign in. There was a grapevine thicket on one of the ridges and feeding sign was heavy. 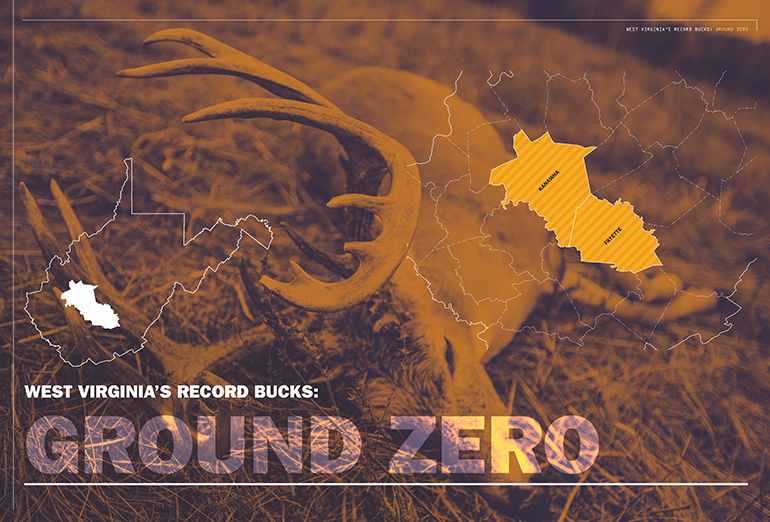 In this area of the mountain state, if you want to shoot a buck, hunt for the does. Nibert knew he had taken a good buck but had no idea how good until he grabbed the antlers. The old mountain buck went a measured 200 5/8 inches on the tape, making him a buck of a lifetime for any hunter. Shaw noted that hunting success varies according to which section of the county you choose to hunt in. Eastern Kanawha County has rugged terrain that reminds hunters of southern West Virginia, and the Paint Creek and Cabin Creek drainages are rough places to hunt. This difficulty in hunting allows the deer to reach impressive size, and a large percentage of the deer racks entered in the Big Buck Contest come from this part of the state. Western Kanawha County has better deer habitat so deer densities are higher. The deer kill is typically highest in this part of the county, but racks aren’t as good as the eastern section. The terrain permits easier hunting so the bucks normally don’t grow as old as those in the rougher eastern part. Two wildlife management areas are available in Kanawha County. One is Morris Creek WMA, located near Clendenin, West Virginia and accessible on County Route 67 along Morris Creek, on by County Route 65 which follows Leatherwood Creek. Morris Creek spans almost 10,000 acers and the terrain is, to say the least, rugged. Kanawha State Forest is almost equal in size to Morris Creek and can be access south of Charleston off State Route 214 by following signage to the forest. 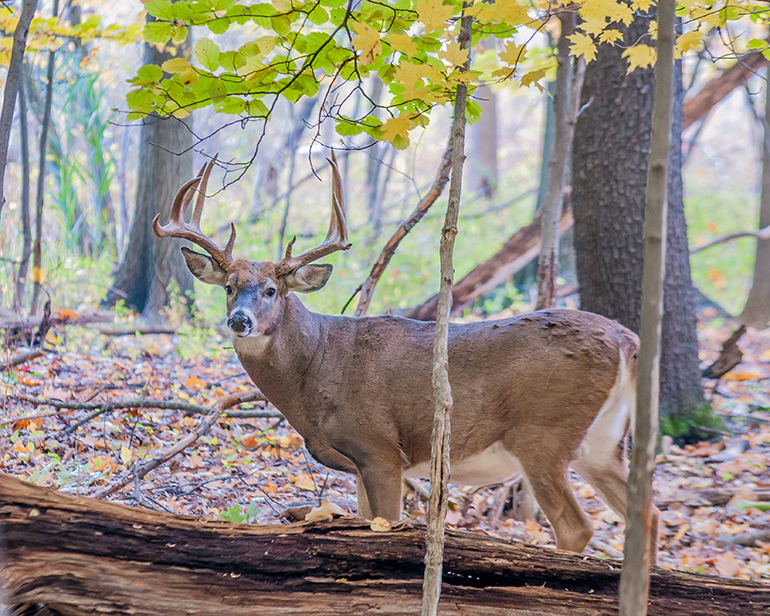 While some might say Kanawha State Forest is located too close to the urban area of Charleston, it is almost 10,000 acres and you may very well be surprised at the bucks you find there. Looking at a map of Kanawha County you will quickly see a huge portion of the eastern part of the county (almost everything south of Rt. 119 and east of Interstate 77) is some big country, much of it owned by coal and timber companies. Most of this area is available to hunters. Some of this area is available for leases and a thorough scouting trip would be in order if you decide to hunt this area. “If you look at the terrain east of Charleston, WV and west of that city, the differences are striking,” said Dan Kessel, owner of Spring Hill Rod and Gun (www.springrodandgun.com 304-768-2090), a popular hangout for hunters in South Charleston. Dan is an experienced deer hunter and stays tuned in to local hunters at his shop. Kessel pointed out that most hunters just don’t want to face this, so you are going have a lot less competition. He noted that he knew hunters who routinely carry a change of clothes when hiking in to a stand. Once there they will change from sweaty attire to wear scent free clothes on the stand. This will give you some indication of how arduous the hike may be. If you agree with the notion that nothing worthwhile is easy, hunting for big bucks in the country like Fayette and Kanawha counties may be for you. Don’t expect a leisurely 30-minute walk to put you in deer country, but you may stand a chance of collecting a buck that will leave your hunting buddies green with envy.